Drawing on examples from the authors’ own experience as exhibition designers, this book examines every phase of exhibition creation. Topics include concept and design, presentation and staging, communicative forms and media, text and graphics, typography and layout, and the use of lighting. 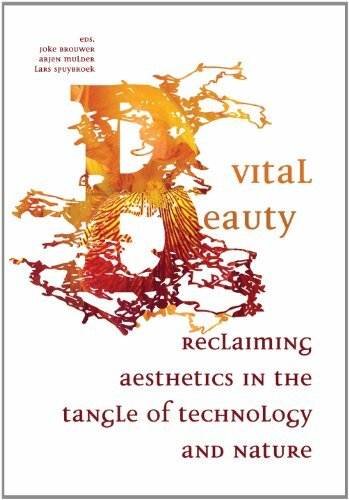 In this book, leading philosophers, anthropologists, political thinkers and artists take a closer look at what the idea of beauty can mean to their disciplines, in an effort to redefine what beauty is and what it means to design practice and art. The conception of beauty presented in Vital Beautyaims to draw a line under a century filled with excessive worship of the sublime in art and architecture. Vital beauty, in this book, is conceived as a form of beauty that is imperfect and impure. Over 150 years ago, British art critic John Ruskin came up with the concept and thereby liberated beauty from classical perfection and harmony. In this he acknowledged the fact that we live in a world of currents and forces and that these forces bring forth objects. Vital beauty might just be the ideal label for the combination of the vitality of material and information flows, and the beautiful mountains, clouds, books and edifices that they produce. For a full list of entries and contributors, a generous selection of sample entries, and more, visit the Encyclopedia of Sculpture website. With an international scope, this fully illustrated reference spans the entire history of sculpture, from prehistoric times to the twenty-first century. While devoting significant attention to individual artists and their works, the Encyclopedia also explores sculpture from the vantage points of history, criticism, theory, aesthetics, production, training, and presentation, making this the most comprehensive, in-depth source on the subject ever published. The Museum of Modern Art Design Encyclopediais the most comprehensive design reference guide to date. Compiled over the last 15 years by Mel Byars, in consultation with an international team of design experts, The Encyclopediasets out to provide the factual framework of a discipline whose own historical accounting of itself is still relatively young. (By way of contrast, art history has existed as a scholarly discipline for over two centuries, and has produced a fairly comprehensive record of itself in that time period.) Only once before has a similarly comprehensive overview of the history of design been attempted–in 1994, also by Mel Byars. The Encyclopediais about design, of course, but these days “design” seems to encompass almost everything, from magazine layouts and sweatshirts to animatronic flower gardens and heart pumps, not to mention the more abstract “information design.” Here, however, design is considered only in its concrete application to functional objects, thus crossing with craft, decorative arts, and industrial design, but distinguishing itself from fine art and theory. The result is 832 pages covering the last 130 years in the history of the design of furniture, lighting, fabrics, ceramics, glassware, metalware, objects in a range of other materials, and mechanical, electrical and electronic appliances, as well as automobiles and some inventions. There are separate entries for designers and craftspeople, design studios, consortiums and partnerships, noteworthy manufacturers, significant historical periods and styles, and materials. Entries, 3,600 in all, are self-contained and organized alphabetically, and include cross-references. Information is an amalgamation of data gathered from a vast number of primary and secondary sources. With over 700 full-color illustrations, most of which are drawn from the MoMA collection, the remainder from Quittenbaum Kunstauktionen in Munich and Hamburg or directly from designers or manufacturers, this publication is an invaluable, definitive compendium of the world of design over the last century and a half. This dictionary provides a stimulating and categorial foundation for a serious international discourse on design. It is a handbook for everyone concerned with design in career or education, who is interested in it, enjoys it, and wishes to understand it. Covers and defines some 270 terms. The third volume in this magisterial series contains articles on Egyptian Blue, Orpiment and Realgar, Indigo and Woad, Madder and Alizarin, Gamboge, Vandyke Brown, Prussian Blue, Emerald Green and Scheele’s Green, Chromium Oxide Greens, and Titanium Dioxide Whites. Discover all the lessons and insights that a lifetime of painting provides!The best way to learn something is with a great teacher. Let them speak, and listen closely. When it comes to painting, you need look no further than Watercolor Wisdom. Inside, Jo Taylor shares all the knowledge and experience she’s accumulated over three decades of painting and teaching in watercolor.Packed with insights, tricks and invaluable tips, Watercolor Wisdom is a virtual master class in watercolor painting. Taylor illustrates every important technique and concept with examples, sketches, diagrams and demonstrations, whether covering the basics, such as brush selection, composition, value and color mixing or more advanced considerations. You’ll learn how to find your personal style, express emotion in your work, understand and create abstract art and more.Let Jo Taylor help you to become watercolor wise today! There’s no better way to learn, and no better teacher to guide you. Increasing use of digital signals for transmitting data in television, photography and printing means the reproduction of pictorial colour in the 21st century continues to drive innovation in its development. Hunt’s classic text The Reproduction of Colour has been fully revised and updated for the sixth edition to provide a comprehensive introduction to colour imaging and colour reproduction. New illustrations, diagrams and photographs ensure that both students and practising engineers using colour images can gain a full understanding of the theory and practical applications behind the phenomena they encounter. Key features: Describes the fundamental principles of colour reproduction for photography, television, printing and electronic imaging. Provides detailed coverage of the physics of light and the property of colorants. Includes new chapters on digital printing and digital imaging, which discuss colour reproduction on HDTV and desktop publishing. Presents expanded coverage of the evaluation of colour appearance. The Reproduction of Colour is already used as a basis for lectures in universities and specialist institutions and continues to be an essential resource for scientists, engineers and developers needing to appreciate the technologies of colour perception. Reviews of the Fifth Edition: “The book is beautifully written and superbly presented. It is a credit to both author and publisher, and deserves to be on the shelves of anyone who has any concern with the reproduction of colour.” From The Journal of Photographic Science, Vol. 43 1995 “Using his ability as a teacher, Dr Hunt has made potentially very difficult topics quite readable…he brings the insight that leads the reader to a greater depth of understanding.” From Color Research and Application, Vol. 23 1998 The Society for Imaging Science and Technology is an international society that aims to advance the science and practices of image assessment. A major objective of the Wiley-IS&T series will be to explain the latest scientific and technological developments in the field of imaging at a professional level. The broad scope of the series will focus on imaging in all its aspects, with particular emphasis on digital printing, electronic imaging, photofinishing, image preservation, image assessment, image archiving, pre-press technologies and hybrid imaging systems. An important source of information for any institution charged with the preservation of color prints, negatives, color slides, motion pictures, and black and white prints. Twenty illustrated chapters cover all aspects of color preservation, plus comprehensive recommendations on the storage and display of black and white photographs. Gathers previously unpublished color photographs of the Grand Canyon, Monument Valley, El Capitan, Yosemite National Park, Mount McKinley, Mono Lake, Death Valley, and White Sands National Monument. Praised in its original edition for its up-to-date, rigorous presentation of current debates and for the clarity of its presentation, Robert Stecker’s new edition of Aesthetics and the Philosophy of Art preserves the major themes and conclusions of the original, while expanding its content, providing new features, and enhancing accessibility. Stecker introduces students to the history and evolution of aesthetics, and also makes an important distinction between aesthetics and philosophy of art. While aesthetics is the study of value, philosophy of art deals with a much wider array of questions including issues in metaphysics, epistemology, the philosophy of mind, as well value theory. Described as a “remarkably unified introduction to many contemporary debates in aesthetics and the philosophy of art,” Stecker specializes in sympathetically laying bear the play of argument that emerges as competing views on a topic engage each other. This book does not simply present a controversy in its current state of play, but instead demonstrates a philosophical mind at work helping to advance the issue toward a solution. The first in a trilogy, this tale draws upon Chinese myth and legend in a tour de force of classic storytelling. A volcanic eruption releases a vanguard of demons, sealed away for centuries beneath the earth. Soon after, the Emperor’s son is born, marked with the sign of the Qin–the brand of the outlaw. The Emperor plots to kill his only heir before the boy can usurp the throne but he is foiled by a mysterious monk with magical tattoos and a trickster monkey. A host of warring guardians must unite to help the Starlord unlock the kung fu secrets of the Twelve Scrolls and save the earth from destruction. A book of colorful photographic abstractions in juxtaposition with figurative and landscape photographs, by Shirana Shahbazi. Accompanying writing by Urs Stahel. The Art Atlas is the first work to present the art of the entire world from ancient tomodern times through extensive use of specially commissioned maps. Coveringpainting, sculpture, and architecture as well as other arts and artifacts, the volumeprovides an entirely new vision of the history of the worldGÇÖs art by showing howphysical and political geography has shaped its developments.Over 350 pages in scope, Atlas compares countries separated by thousands ofmiles and many centuries, demonstrating how the art of each is affected by opportunitiesand constraints dictated by location or culture. Here, for the first time,readers can appreciate the art of prehistoric Oceania and the Nile Valley of thePharaohs alongside that of nineteenth-century Russia and the twentieth-centuryUnited States. In addition to showing where and when great artists lived andworked, Atlas explains how major styles developed and the ways in which art hasbeen influenced by religion, trade, travel, war, and other historical factors. The volumealso provides the first comprehensive picture of the impact of the naturalworld on the development of art, charting the sources of fibers for weaving, pigmentsfor coloring, wood for carving, paper for printing, and stone for use insculpture and architecture.With its combination of enormous breadth and constant clarity of focus,abdundant illustrations and a user-friendly, searchable CD, Atlas provides exceptionalinsight into what unites art and what makes it so varied. Organized intoseven chronological periods and including contributions from 68 internationallyrenowned art historians, The Art Atlas is an original, comprehensive and up-todatereference work that will be a benchmark for many years to come. Bien-U Bae’s meditative landscape photographs possess an almost calligraphic quality. Created over the past 20 years, this new series features landscapes in motion: trees and grass lean in the wind; steep crags, cliffs, and rocks and stones shaped by water are enveloped in sea spray and fog. The Korean word for landscape is a compound of the words “wind” and “scenery.” It is closely bound to the traditional cosmological notion that an essential quality, “the ether”, permeates all living things. The poetic neologism “windscape” is a literal translation of this term. Not a graphic designer? Not a problem! Whether the project’s a birthday card, a poster, or a flier, Graphic Design for Nondesigners is here to help. Twenty step-by-step projects for designing everything from Web sites to business cards to T-shirts are accompanied by a clear and concise initiation into the basic principles of graphic design–including the effective use of space, color, and type–presented in a way that’s easy for anyone to start applying right away. Armed with this essential primer, nondesigners will have everything they need to go forth and create effective design with polish, panache, and grace. Defining photography is impossible. Revealing it is another matter, and that’s what The Concise Focal Encyclopedia of Photography does, with each turn of the page. History: The technical origins and evolution of photography are half of the story. The other half consists of the ways that cultural forces have transformed photography into a constellation of practices more diverse than any other mode of representation. Photographers can tell a more in-depth story through a photo like Dorothea Lange’s “Migrant Mother” than a journalist ever could with the written word alone. Major themes and practitioners: Over 25 entries, many with supporting illustrations, examine the figures, trends, and ideas that have contributed most heavily to the history and current state of photography. Contemporary issues: The issues influencing photography today are more complex than at any other time in its history. Questions of ethics, desire, perception, digitization, and commercialization all vie for attention. Hear what the experts have to say about crucial issues such as whether or not the images we take today will last the test of time, and if so, how? When material is covered this skillfully, “concise” is no compromise. The Concise Focal Encyclopedia of Photography is packed with useful information, compelling ideas, and – best of all – pure pleasure. A comprehensive reference traces the history of photography from the invention of the daguerreotype in 1829 to the breakthroughs in digital photography today, covering such key themes as portraits, still lifes, photojournalism, and NASA images while exploring the ways that the use of pictures has influenced public perspectives. As our culture relocates into digital realms, numerous artists have returned to a studio practice grounded in “doing” and “making.” New Image Sculptureunites the work of artists who freely borrow from the worlds of ethnographic and material culture, folk art, fashion, hobby crafts, DIY and the shelves of Home Depot. Where is Production? is the first instalment of Black Dog Publishing’s series Inquiries into Contemporary Sculpture that explores what constitutes, excites, entangles, and necessitates ideas and questions around sculpture. Each volume in the series chooses a different line of inquiry, aided by a select group of artists, curators and historians. Where is Production? is an exploration into the medium’s modes and sites of production. It questions the meaning of the word ‘production’ itself, what it encompasses, and how it informs and leads sculptural practice today. With contributions by SculptureCenter members of staff – Mary Ceruti, the Executive Director and Chief Curator, and Ruba Katrib, Curator – alongside artist Carol Bove and Editor-in-chief of Artforum magazine Michelle Kuo, amongst others. Where is Production? is an insightful, thought-provoking look at contemporary sculpture, for those interested in the field and contemporary art as a whole. The SculptureCenter is a not-for-profit arts institution in Long Island City, New York, dedicated to experimental and innovative developments in contemporary sculpture. How did you get the concept for Part Object Part Sculpture? I remain fascinated by the tricky nature of Duchamp’s readymades–objects transformed into art, but not quite. They always retain their original identity or function. This is why many people refer to Fountain in a casual way as “the urinal.” For me this is an acknowledgment that the work is part art, part not–part object, part sculpture. What is new about your interpretation of Duchamp? I insist that we see the readymades produced in the 1960s as quite different from the readymades that were purchased by Duchamp in the teens. They are different objects, with different sets of rules. Hence they behave differently in the gallery and ultimately mean different things. I have also tried to keep Duchamp’s readymades in dialogue with his lifelong interest in eros. These two strains of his thought have been kept separate–wrongly, I think–in the American reception of Duchamp. The artists featured in Part Object Part Sculpture come from different generations, different national traditions. Why do you bring them together in this exhibition and book? I am trying to map a genealogy of postwar sculpture that challenges the Minimalist/Post-Minimalist sequence maintained in most accounts of the period. The exhibition begins in the 1950s and comes up to the present. Also, it has become increasingly difficult to narrate postwar art as predominantly or exclusively American. Artists have been engaging in an enormous transatlantic dialogue. Is there any single work in the catalogue that can be singled out as emblematic of your intervention? No, not at all. It is precisely the constellation of figures like Burri, Duchamp, and Bourgeois, and then Duchamp and Hesse and Johns, and then Duchamp and Kusama and Gober, and then Duchamp and McElheney, that makes the exhibition so potentially interesting. How did you and your collaborators develop the scope and aim of the essays in the book? I asked writers who were working on the artists in the show and have won my admiration for the sensitivity of their writing and the unconventional nature of their thought. I then allowed them to write what they pleased. The outcome is a book to be considered as another site where the counter-genealogy is being built and argued for. Louis XVI planned the transformation of the Louvre from a royal palace to public museum. But it was the Revolution which gave the real impetus: the Grande Gallerie was finally opened by Napoleon in 1793. People who run small, rural libraries without formal education will use this book to help them make informed decisions about the organization of their library and the information it holds. This is one of the key tasks in any library. While many librarians may buy all of their items already cataloged, they may need to catalog an item, change a subject heading, or tape a classification number to a book. Reading this book, analyzing the examples, and working through problem sets provides an exciting introduction to organizing the library. It serves as an excellent tool for staff development of paraprofessionals. Analyst and author Ann Belford Ulanov draws on her years of clinical work and reflection to make the point that madness and creativity share a kinship, an insight that shakes both analysand and analyst to the core, reminding us as it does that the suffering places of the human psyche are inextricably–and, often inexplicably–related to the fountains of creativity, service, and even genius. She poses disturbing questions: How do we depend on order, when chaos is a necessary part of existence? What are we to make of evil–both that surrounding us and that within us? Is there a myth of meaning that can contain all the differences that threaten to shatter us? Ulanov’s insights unfold in conversation with themes in Jung’s Red Book which, according to Jung, present the most important experiences of his life, themes he explicated in his subsequent theories. In words and paintings Jung displays his psychic encounters from1913-1928, describing them as inner images that “burst forth from the unconscious and flooded me like an enigmatic stream and threatened to break me.” Responding to some of Jung’s more fantastic encounters as he illustrated them, Ulanov suggests that our problems and compulsions may show us the path our creativity should take. With Jung she asserts that the multiplicities within and around us are, paradoxically, pieces of a greater whole that can provide healing and unity as, in her words, “every part of us and of our world gets a seat at the table.” Taken from Ulanov’s addresses at the 2012 Fay Lectures in Analytical Psychology, Madness and Creativity stands as a carefully crafted presentation, with many clinical examples of human courage and fulfillment. ..”.Full of keen and illuminating insight…Written with creative flair and great elegance.” Robert Olen Butler Author, “A Good Scent from a Strange Mountain ” Winner of the 1993 Pulitzer Prize in Fiction ..”.Witty, charming, and informative…”Creativity 101″ makes a convincing case for the importance of creativity in society, in our schools, and in our daily lives….And no, we aren’t related.” Scott Barry Kaufman, PhD Author, ” The Psychology of Creative Writing” ” An] excellent primer or review of what is out there in terms of research, definitions, theoretical considerations, and leading thinkers in the world of creativity.”–Gifted and Talented International What is creativity and how can we measure it? “Creativity 101” serves as a brief, engaging introduction to the field of creativity. Dr. Kaufman presents the cutting-edge research and analyzes new and emerging theories in the field. This book investigates the many definitions of creativity, as well as how it is manifested and measured in schools, the workplace, business, art, media, and more. Key Topics Discussed: The “Four Ps” of creativity: person, product, process, and press How creativity influences personality, motivation, intelligence, and talent The dark side of creativity: the remarkable relationship between creativity and mental illness Emerging directions in creativity research, with discussions on neuroscience, the media, and literature The Psych 101 Series Short, reader-friendly introductions to cutting-edge topics in psychology. With key concepts, controversial topics, and fascinating accounts of up-to-the-minute research, “The Psych 101 Series” is a valuable resource for all students of psychology and anyone interested in the field. Ian Wallace: At the Intersection of Painting and Photography is a monograph on the photographic work of one of Canada’s most significant contemporary artists. Ian Wallace’s influence is lasting and broad. He has made an outstanding impact on both his contemporaries and subsequent generations through his important work as an art historian, critic and educator and also through an art practice that has consistently demonstrated conceptual rigor and aesthetic innovation. The book draws together these key themes by presenting the images alongside essays split by nature— Still image; Studio; Museum; Street and including a chronology of key works. This book covers the full range of his distinguished career and the principle themes that he has evolved over four decades of work. An all-new showcase of the energetic work that’s driving typography today — from the most extreme garage fonts to the new digital typefonts. This book constitutes the refereed proceedings of the 11th International C- ference on Asian Digital Libraries (ICADL 2008) held in Bali, Indonesia, in December 2008. The objective of this conference series is to provide a forum for presentation of high-quality research in the ?eld of digital libraries. ICADL 2008 provided an opportunity for digital libraries researchers and practitioners in the Asia Paci?c area and beyond to gather to explore ideas, exchange and share experiences, and further build the research network in this region. ICADL 2008 was a truly international event, with presenters from 21 countries. A total of 63 papers were accepted for inclusion in the proceedings: 30 full papers, 20 short papers, and extended abstracts of 13 posters. Submissions were subject to a rigorous, blind peer-review process. The research topics cover the spectrum of digital libraries, including multimedia digital libraries, usab- ity and evaluation, information retrieval, ontologies, social tagging, metadata issues, multi- and cross-language retrieval, digital preservation, scholarly p- lishing and communities, and more. Additionally, three tutorials were o?ered in association with the conference by Andreas Rauber (Vienna University of Technology), David Bainbridge (University of Waikato), and George Buchanan (Swansea University). Artist, architect, poet and philosopher, Leon Battista Alberti revolutionized the history of art with his theories of perspective in On Painting (1435). Inspired by the order and beauty inherent in nature, his groundbreaking work sets out the principles of distance, dimension and proportion; instructs the painter on how to use the rules of composition, representation, light and colour to create work that is graceful and pleasing to the eye; and stipulates the moral and artistic pre-requisites of the successful painter. On Painting had an immediate and profound influence on Italian Renaissance artists including Ghiberti, Fra Angelico and Veneziano and on later figures such as Leonardo da Vinci, and remains a compelling theory of art. Kay Ann Cassell and Uma Hiremath expand on their tremendously successful approach to reference service with this new edition of their revolutionary text. This practical guide teaches failsafe methods for identifying important materials by matching specific types of questions to the best available sources regardless of format. There s a completely new chapter on using cutting-edge technology plus expanded coverage of marketing reference service, and providing chat and IM reference. Of particular value to practitioners is the discussion of staff competencies needed now and in the future. The book is comprehensive in its coverage, with sections on fundamental concepts, major reference sources, special topics in reference and information work (including separate chapters on reader s advisory and youth services written by acclaimed expert Mary Kay Chelton who has added coverage of non-fiction), and developing and managing reference collections and services. Fresh material covers pertinent new topics in reference services and technology, including competencies and training in Web site development and maintenance, database evaluation, RSS feeds, blogs, popular social networking sites such as Facebook, and the ability to provide reference service across multiple formats. Guided by a national advisory board of educators and practitioners, this landmark text expertly combines both practical elements and guiding principles.